What are Glofish? How are they being used? 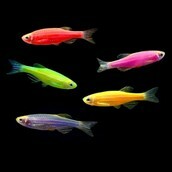 Glofish are genetically modified neon fluorescent fish used to detect pollution in waterways, or as household pets. A fluorescent gene, mostly from jellyfish or sea anemones are added to zebrafish or tetra fish before they hatch their eggs, creating the genetically engineered glofish. These glofish can now be able to pass on its fluorescent trait to its offspring and so on. 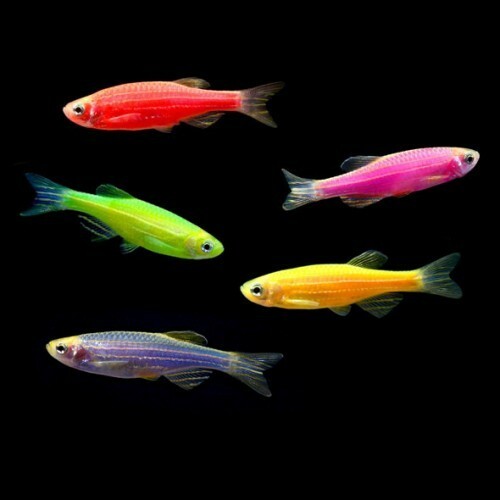 Glofish are currently being used as pets and are also being used to detect pollution in waterways. Non-fluorescing fish will signal that the water is clean, while a fluorescing fish will signal pollution. -Glofish help discover pollution by fluorescing in polluted waters. -Glofish are safe for the environment. -Glofish cannot survive if they escape into waterways. Glofish affect humans by ensuring that our water we use in our everyday life is safe. Millions of glofish are sold everyday to scientists and regular families who want a pet glofish. Glofish are banned in Australia, Canada and Europe due to the fact that they are GMOs. Glofish will affect our future by preventing pollution in waterways by letting scientists know by fluorescing if the water isn't clean.